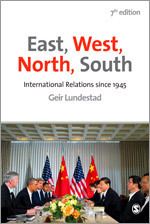 The seventh edition of Geir Lundestad’s classic overview of the history and key developments of international politics in the post-war era continues in the clear, accessible and authoritative vein of previous editions. The book provides an engaging narrative of all the significant events since 1945 and equips you with the knowledge and skills with which to approach contemporary issues in international politics. Complete with annotated further reading lists accompanying each chapter, the book skilfully guides you through all the important events that have shaped the international system since 1945. East, West, North, South remains essential, accessible reading for all students of international relations, world politics and international history.